On Thursday’s CBS Early Show, co-host Harry Smith opened the show by declaring: "As President Obama heads on his first foreign trip, some state governors are saying 'thanks, but no thanks' to the stimulus money, even in these desperate times. We'll ask one of them why." 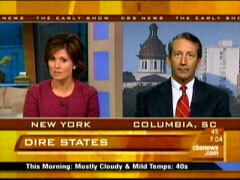 Later, co-host Maggie Rodriguez interviewed Republican South Carolina Governor Mark Sanford and asked: "Even if it takes a while to get the money, how do you justify, let's say, not taking it to your constituents when in your state, for example, in December had the third highest unemployment rate in the country. Don't you need the money?" After Sanford explained that he was opposed to the bill but may accept some of the funding, Rodriguez responded: "You say you're against it, but you still might take the money. Do you realize how some people might think that you're putting ideology ahead of the interests of your constituents?" He began to reply: "Well, I'd say it's the reverse. If we take the money -- in other words, I've said -- I've made my ideological stand, saying this is a bad idea-" Rodriguez interrupted: "But if you're so against it, why take the money?" On Wednesday’s CBS Evening News, correspondent Bill Whitaker reported on the importance of the stimulus bill for states: "California is by far the worst, but 46 states face serious budget shortfalls. All 28 Democratic governors, and four Republicans, welcome the stimulus money, including Charlie Crist of Florida...Minnesota's Tim Pawlenty says he doesn't like the package but with a $5 billion deficit, he'll take the money... Here in California, taking the federal money is the one thing the Republican Governor and almost every other politician can agree on." Whitaker made only brief mention of Republican governors opposing the federal funding: "But for other GOP governors, it's problematic. While all have shovel-ready projects, some have philosophical objections. Alaska's Palin, Barbour of Mississippi, and Jindal of Louisiana say they might not take the money...Texan Rick Perry is mulling it over." HARRY SMITH: As President Obama heads on his first foreign trip, some state governors are saying 'thanks, but no thanks' to the stimulus money, even in these desperate times. We'll ask one of them why. MAGGIE RODRIGUEZ: Let's talk more specifically, now, about the stimulus bill. Some Republican governors have questions and concerns about the measure. We're joined by one of them, Governor Mark Sanford of South Carolina, head of the Republican Governors Association. Good morning, Governor. RODRIGUEZ: It's no secret that Republicans, many of them, most of them in Congress, don't support this, but a number of Republican governors do because it offers so much aid for the states. Why don't you? SANFORD: Well, I think that what I've said and what a bunch of other folks have said as well, is that, one, there are real strings attached, that I think actually hamper your ability to implement the use of this money. Congressional Budget Office has pointed out the fact that there's a real lag time in actually getting this money into the economy. And I think that the problem that was created with too much debt will never be solved by adding yet more debt. So I think that there are a number of different wrinkles that have caused a number of us to say wait a minute, let's take a look -- a long look at whether or not this really makes sense for our state. RODRIGUEZ: Even if it takes a while to get the money, how do you justify, let's say, not taking it to your constituents when in your state, for example, in December had the third highest unemployment rate in the country. Don't you need the money? SANFORD: Again, being against it doesn't preclude taking the money. So again, we're going to look at it, but what you find when you actually begin to look under the hood is that some of those strings attached mean you've got to spend a lot more money that you don't have to be eligible for the funds. For instance, on the unemployment component, you'd have to for the first time offer unemployment benefits to part-time workers. That's something our state has never done. Though the Unemployment Commission itself has gone and asked for $140 million from the feds and asked yet again for $170 million from the feds to keep up our current level of benefits payable. RODRIGUEZ: You say you're against it, but you still might take the money. Do you realize how some people might think that you're putting ideology ahead of the interests of your constituents? RODRIGUEZ: But if you're so against it, why take the money? SANFORD: -don't think -- Because ultimately I represent more -- you know, almost 5 million people in South Carolina and the stand that I take against a bad idea. And again, I've tried to sprinkle as many tacks in the road in terms of trying to slow this freight train that has been coming our country's way that I think will have bad ramifications and will not solve the economy. In fact, it's done the reverse. I think it's effectively frozen up private capital, which is the real economic stimulus of our country. But I've taken those stands. Now when you get to the point where we're at now, it -- we did not stop it. It passed and we're going to take a judicious look at parts that we like, parts that we don't like, all that we like, none that we like, and make a decision here over the weeks ahead. RODRIGUEZ: Governor, in the last seconds, do you think that the new foreclosure rescue plan will help people in your state? because a lot of folks that do play by the rules, who have been paying their mortgages, are going to feel like the sucker at the birthday party as the neighbor down the street may end up with benefits that they don't have. RODRIGUEZ: Governor Mark Sanford, thank you very much for your time this morning. KATIE COURIC: The president's $787 billion plan for boosting the economy will help state and local governments struggling to pay their bills. $144 billion of the stimulus, close to 20%, will go to them. For states like California, Bill Whitaker reports, the money can't come soon enough. BILL WHITAKER: It may look sunny in California, but there are stormy days ahead. After a three-month marathon budget session, the last push had legislators sleeping at their desks, no agreement on how to close a gaping $41.6 billion deficit. The impasse has brought construction projects to a halt, state workers are being laid off. ALAN LOWENTHAL [DEMOCRAT, CALIFORNIA STATE SENATE]: If we do not pass this budget and this tax increase today, the California dream will turn into the California nightmare. WHITAKER: With Democrats seeking tax increases, Republicans, spending cuts, the only relief on the horizon, the federal economic stimulus money. DAVID CRANE [SPECIAL ADVISOR TO GOV. SCHWARZENEGGER]: Around $9 billion will go to the state and that will make a difference when it comes to the state expenditures. But, of course, it doesn't address our budget issue. WHITAKER: California is by far the worst, but 46 states face serious budget shortfalls. All 28 Democratic governors, and four Republicans, welcome the stimulus money, including Charlie Crist of Florida. CHARLIE CRIST: This is not about partisan politics, this is about rising above that. WHITAKER: But for other GOP governors, it's problematic. While all have shovel-ready projects, some have philosophical objections. Alaska's Palin, Barbour of Mississippi, and Jindal of Louisiana say they might not take the money. BOBBY JINDAL: I have grave concerns about the amount of money that's being spent in Washington. WHITAKER: Texan Rick Perry is mulling it over. RICK PERRY: In Texas, we actually know it is a good idea to look a gift horse in the mouth. WHITAKER: Minnesota's Tim Pawlenty says he doesn't like the package but with a $5 billion deficit, he'll take the money. TIM PAWLENTY: Minnesota paying way more into the federal government than it takes out, it's okay for us to accept our share. WHITAKER: Here in California, taking the federal money is the one thing the Republican Governor and almost every other politician can agree on. Bill Whitaker, CBS News, Los Angeles.